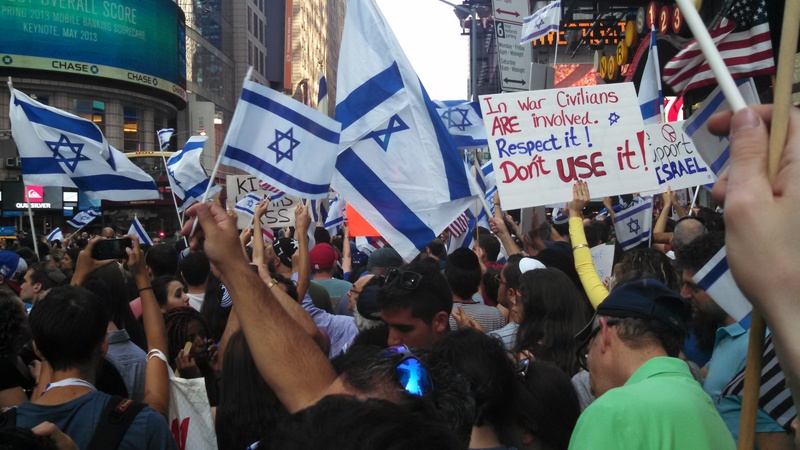 One of the loudest ovations at the Pro-Israel rally in Times Square yesterday July 20, 2014, was for none other than a Palestinian man. When the man took the microphone and shouted the words, “I am a Palestinian. I love Israel and I hate Hamas”, the crowd erupted. To all those who call Israel an Apartheid state I present this challenge. Find me one none-white individual who ever said they love South Africa during the reign of Apartheid. And then find me an instance of a crowd gathering in support of South Africa’s government of that era that welcomed a person of color with love and support as this man was yesterday. You won’t find it. It’s very simple. Those who want to live in peace are welcome and will be treated like everyone else. Sure there are people in any group that have an indestructible hate in their heart, but as a general rule this is the morality we live by. A morality of which we can and should all be proud. This entry was posted on Monday, July 21st, 2014 at 12:06 pm	and tagged with apartheid, Hamas, Israel, Palestinian, pro-Israel rally, South Africa, Times Square and posted in Uncategorized. You can follow any responses to this entry through the RSS 2.0 feed.